KENNEDY SPACE CENTER, Fla. — The public often forgets that there were six successful crewed missions to send astronauts to the surface of the Moon in the late ’60s and early ’70s. Apollo 16 was the next-to-last mission and would see crews sent to the lunar highlands for the first time ever. Lifting off on their massive Saturn V rocket from Kennedy Space Center’s Launch Complex 39A on April 16, 1972, Apollo 16’s John Young (commander), Charlie Duke (lunar module pilot), and Kenneth Mattingly II (command module pilot) embarked on a roughly 11-day voyage of discovery at the twilight of NASA’s crewed exploration of the Solar System in the 20th century. Everything on Apollo 16’s flight went to plan until the Command and Service Module (CSM) and Lunar Module (LM) undocked in lunar orbit. Shortly after, the CSM began to move strangely due to an apparent problem in the craft’s thruster controls. This required the CSM and LM to remain close together until the problem was fixed. At least partly because of this, the LM descended to the lunar surface almost six hours behind schedule and landed in the Descartes highlands just 230 meters from the targeted landing area. At 18,045 feet (5,500 m) above lunar “sea level”, this was the highest crewed lunar landing. “There you are, mysterious and unknown Descartes highland plains. Apollo 16 is gonna change your image […] I’m sure glad they got ol’ Brer Rabbit here, back in the briar patch where he belongs,” John Young said as the crew of Apollo 16 orbited the Moon. During the first moonwalk, the astronauts deployed the ALSEP (Apollo Lunar Science Experiment Package) and drove the Lunar Roving Vehicle (LRV) to Flag Crater. Unfortunately, Young tripped and fell over one of the leads attached to the ALSEP, rendering the experiment package useless. However, the day ended well for the duo because, during their excursion, they learned that Congress had approved Fiscal Year 1973 which provided funding for the Space Shuttle program, without which the program could have been canceled. Young, who later commanded the first Shuttle mission, jumped in the air – or, rather, the vacuum – when he heard the news. 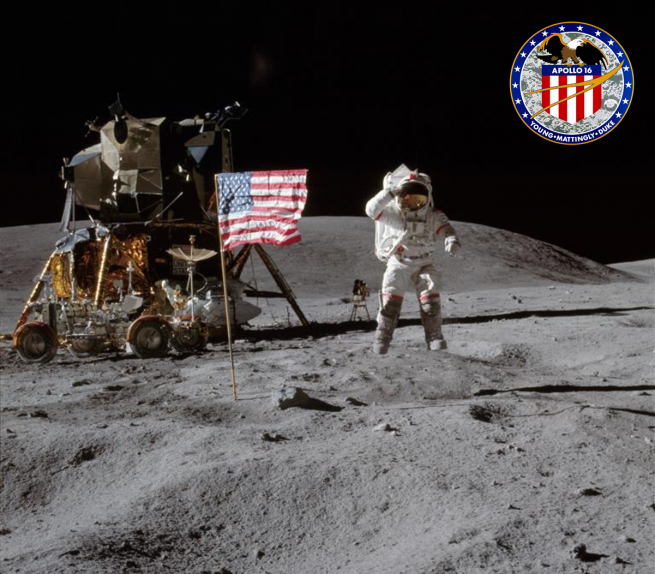 During the second moonwalk, the astronauts drove the LRV to Stone Mountain where they made observations and collected rock and soil samples. The third drive, to Smoky Mountain, was cut short because the water supply for cooling the LM’s instrumentation was running low – more water than expected had been used during the delay before landing. In fact, the coolant ran out just moments after the LM and CSM re-docked. Several records were broken during the mission, including the highest speed by a vehicle on the lunar surface (21 km/h) and the largest crater yet visited by astronauts – North Ray Crater, about 656 feet (200 m) deep and about a mile (1.5 km) wide. Once Duke, Mattingly, and Young had safely splashed down in the Pacific Ocean, and the trio had boarded the USS Ticonderoga on April 27, 1972, only a single crewed mission remained – the flight of Apollo 17 set for December of 1972. I had the pleasure to meet Charlie Duke 31 years ago. He autographed one of my many books on space. It will remain one of my most prized treasures. A true American hero….and a nice man!